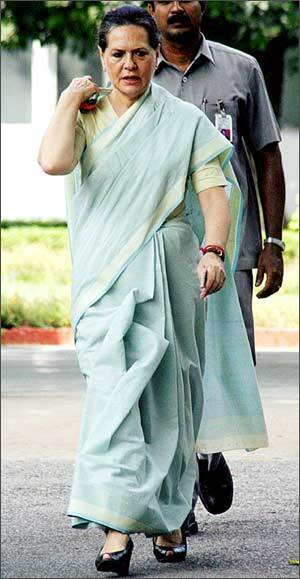 Congress president Sonia Gandhi is among the 100 most powerful women on the planet, according to the Forbes magazine. As per a ranking put together by Forbes magazine, Sonia ranks 13th among the most powerful woman in the world, ahead of US First Lady Laura Bush and England's Queen Elizabeth. 'Sonia frequently expresses concern that India's astounding economic growth is leaving the poor behind and that her country is not doing enough to help its farmers,' the citation adds. The magazine stresses that Sonia heads the most powerful political party and has travelled far since she tentatively entered India's maelstrom in 1990s. 'She won the general election in May 2004 but then took a pass on the prime minister's job, giving it to Dr Singh,' it notes. Though critics used the move to call into question her power, 'Sonia is still widely revered especially among the country's poor millions,' it adds. Other Indians on the Forbes Top 100 Most Powerful Women List include chief executive-designate of PepsiCo Indra Nooyi, joint managing directors of ICICI Bank Lalita Gupte and Kalpana Morparia, and chairman of the Dubai-based Jumbo Group Vidya Chhabria.